In January 2015, Lim and his team introduced a prototype solution, the Early Detection Sensor & Algorithm Package (EDSAP), a stroke detection solution using brainwaves. 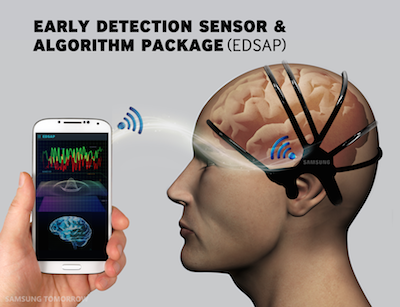 Consisted of a sensor suite and a juiced up algorithm, EDSAP allows anyone with a smartphone or tablet to monitor the electrical impulses that are brainwaves, thereby gauging the probability of an oncoming stroke. The objective is to provide early warning, so that those at risk can visit the doctor for a proper diagnosis with sufficient time to prevent the potentially tragic consequences of a stroke. EDSAP’s sensors are placed on a headset, collecting and wirelessly transmitting brainwave data to a mobile app, where the algorithm analyzes the brainwaves and ultimately determines the likelihood of a stroke, all within a 60-second time span. Additionally, by tracking brainwaves for longer durations, EDSAP can leverage its brainwave analysis capabilities to provide additional information related to neurological health, such as stress, anxiety and sleep patterns. EDSAP sensors are able to monitor and analyze brainwaves much faster than the 15 minutes or so required for existing brainwave monitoring equipment at hospitals. Secondly, the sensors are able to scan brainwaves in comprehensive detail, largely thanks to the highly conductive rubber-like material discovered by Lim and his team. Thirdly, the sensors are easy to wear. Saline solutions no longer need to be rubbed into the hair, removing the unpleasantries that had previously been a part of brainwave scanning. More importantly, in part thanks to the rubber-like material, EDSAP sensors can be scaled down into a variety of form factors reminiscent of everyday objects.